The voters have spoken, and Cupertino’s City Council has a new look. On Thursday evening, the City held a swearing-in ceremony for the three winning candidates from the Nov. 6 election. Newcomers Liang Chao and Jon Willey were sworn into office and Darcy Paul officially began his second term. In a break from unofficial City tradition, the Council selected Steven Scharf as mayor instead of Vice Mayor Rod Sinks. In previous years, vice mayors were usually a lock to be selected as mayor by his or her colleagues. But, the new Council felt that Scharf’s selection would reflect the views of voters in light of Chao and Willey’s victories. Chao, who co-founded slow growth group Better Cupertino, was selected as vice mayor. “I think it’s a mandate. And I think in this case, respecting the will of the voters, is more important than respecting tradition,” Scharf said during the meeting. The evening was also the final meeting for Councilman Barry Chang, who had served since 2009. The meeting, at least for now, appears to have been the final one for Councilmember Savita Vaidhyanathan. While Chao and Paul cruised to victory on Nov. 6, the final seat was very much in doubt for a full month. Willey and Vaidhyanathan were locked in a close race for the final seat as ballots were counted. The final results show Willey 45 votes ahead of Vaidynathan. According to Santa Clara County policy, the Registrar of Voters conducts manual recounts when the margin of victory is either less than .25 percent of the ballots cast, or less than 25 votes. A report on Thursday by The Mercury News states that there will be a recount to determine if Willey did in fact secure more votes than Vaidhyanathan. According to the report, the recount could take several weeks and Willey will hold the seat until it’s completed. If the recount changes the result, Vaidhyanathan would reclaim her seat, according to the report. Vaidynathan was recognized by her colleagues for her service to the City on Thursday evening. 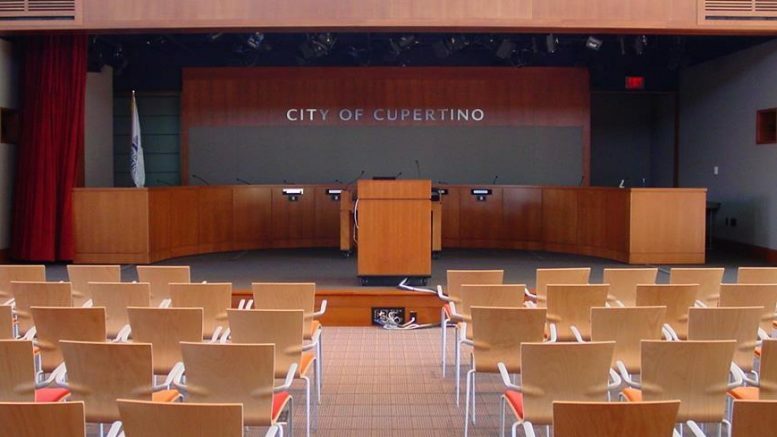 Be the first to comment on "Cupertino’s new City Council takes shape, but recount looms"